How To Play Cribbage - Casino Answers! If you’re not sure how to play Cribbage or what the rules to Cribbage are then don’t worry – we have you covered. This is a nice simple guide that will have you understanding and playing cribbage in a matter of minutes. The Cribbage board offers the option for 3 players to play. Cribbage is generally designed to be used for 2 players, however can be played by up to 4 players. We’ll list how to play Cribbage for two players, then below that will have separate sections to explain the differences in 3 or 4 player play. The Cribbage board has 120 holes in it and then one “game hole”. The object of the game is to get your peg in the game hole, which is basically hole #121 on the board. When you get your peg in that hole, you win the game. When playing Cribbage with two players, the players cut the cards and the highest card is the dealer for the first round. The dealer will deal six cards alternately to each player, all face down, and one at a time. The players then look at their cards, decide which 4 cards to keep, and which 2 cards to discard. The 2 discarded cards will go in the “crib”, which is a hand that the dealer uses at the end of this round. Once the cards have been discard, the player who is not the dealer will cut the cards, and the dealer will take the top card from the bottom cut and turn it face up. This is known as the “starter” and is a card that both players can use when counting up their points at the end. For more information on Cribbage scoring, you can see our Cribbage scoring article where we go into detail about how players can score in Cribbage. We’ll just mention a few options here. The non-dealer is the one that starts the action, by placing one of their cards out face up in the middle of the table. Please note that Aces are 1s, and all face cards count as 10s. The dealer will then put down one of their cards, and this continues until all players are out of cards. At no point can the score go over 31 – if no player can go without putting the total over 31 then the last player to put down a card gets a point, and they start the count again with the remaining cards. During this period, players can score points by getting 15, 31, runs, pairs, trips or even quads. For example, the non-dealer lays down a 7. The dealer places down an 8. This brings the total to 15, and the dealer will get 2 points. The non-dealer then lays down a 9, which has a run of 789. This means that the non-dealer gets 3 points. The current total would be 24. If neither player can go(all their cards are 8 or above) then the non-dealer would get a point for the “last card”, and the count would begin again at 0 with the dealer playing the first card. Once this is done, the players count the points in their hand with the non-dealer going first, and both players use the turn-up card. You can get points for runs, a flush, pairs, trips, quads, and 15s at this point. You can see more details about the scoring in our Cribbage scoring article. The dealer also uses their crib as an additional hand. The advantage to the dealer is that they get 2 hands so the opportunity for additional points; the disadvantage is that they don’t get to count first, which can be crucial come endgame. After all scores have been tallied, the non-dealer becomes the dealer and play continues until a player wins the game by getting 121(or over – it doesn’t have to be exact). You can play Cribbage with 3 players. The only difference from 2 player Cribbage is that each player gets 5 cards as opposed to 6. When the dealer is dealing out the cards, he also puts 1 additional card in the Crib. That way after the cards have been discarded, each player has 4 cards and there’ll be 4 cards in the Crib. 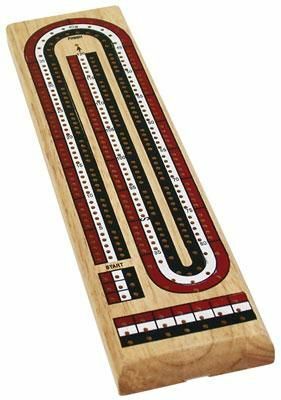 With 4 player Cribbage, players play in teams of 2. Partners can assist the other in regard to tallying up their score, to avoid muggins. Five cards are dealt to each player, and each player must discard one card to the Crib. All play is clockwise.